Alaskan Hospitality with a Southern Twist! Welcome to Tom Dooley’s Trapper Creek Inn & RV Park, an Alaskan owned and family operated business midway between Anchorage and Denali National Park on the George Parks Highway. The business itself was established in 1986 (see About Trapper Creek Inn), and we purchased it in December 2013. Tom came to Alaska from Alabama in 1963 at the age of 20, when he was stationed in Kodiak with the U.S. Navy. He says it was love at first sight, and he spent 50 years on Kodiak Island, where he made his living as a commercial fisherman (salmon, herring, and halibut). He sold his 50' commercial seiner, F/V Rebel, in 2018. Connie came to Alaska in 1999, also from the Deep South, as a higher education consultant and fell in love with the land and the people, so in 2001, she took a temporary position with Kodiak College. Several months later, she met Tom, and her life has never been the same. From adventure on the Gulf of Alaska and Bering Seas aboard the Rebel, to cutting trail and clearing projects on our agricultural land in Fairbanks, to blending two grown families, to hosting guests from all over the world at Trapper Creek Inn & RV Park, we have filled our days together to overflowing. With the help of our children, including Elise who is our General Manager, and our staff, we strive to offer quality goods and services in a clean, inviting, family-friendly facility. Our business is continually evolving, as we look for opportunities to show our customers the best that Alaska has to offer, so keep an eye on our website for new offerings and options as you plan your “trip of a lifetime.” We look forward to seeing you soon! The George Parks Highway, which connects Anchorage, Denali National Park, and Fairbanks, was completed in 1971, opening up access to the previously remote mining and homesteaders community of Trapper Creek and creating a demand for services along the new highway. 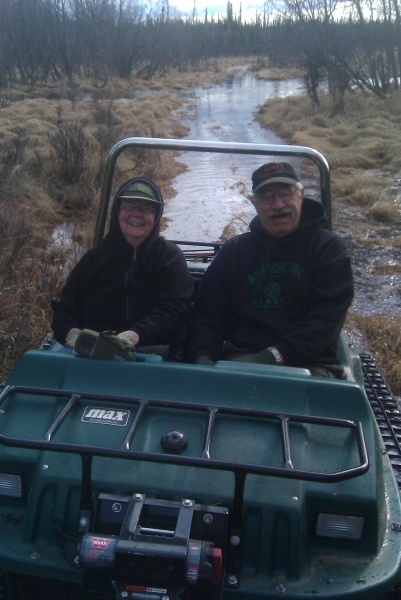 Seeing the need and the opportunities, Bill and Zona Devon established Petracach Inc. (an acronym for Petersville, Trapper Creek, and Cache Creek) in the mid-1980s, when they built the current facilities. Since the first year, the business has catered to the needs of travelers along the Parks Highway, visitors to Denali National Park, year round Trapper Creek residents, and the many temporary residents who have remote vacation cabins scattered throughout the region. In 1994, Pete and Cathy Doyle bought the operation and in 1995 changed the name to Trapper Creek Inn and General Store. When they retired in 2006, Daren and Jennifer Munro took over and added the hangar on the south side of the building and the extensive parking that is available for trucks, motor homes, and “toy boxes” full of snow machines or four-wheelers stopping in for a meal and supplies. Today, Trapper Creek Inn & RV Park retains its identity as a full-service Alaskan travelers’ stop. 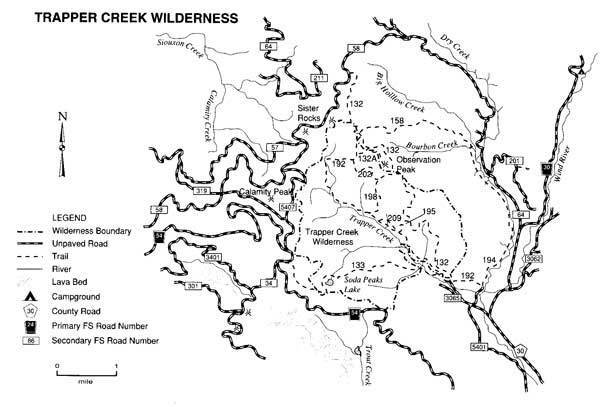 Trapper Creek is situated near the crossing of two roads, Petersville Road and the Parks Highway. 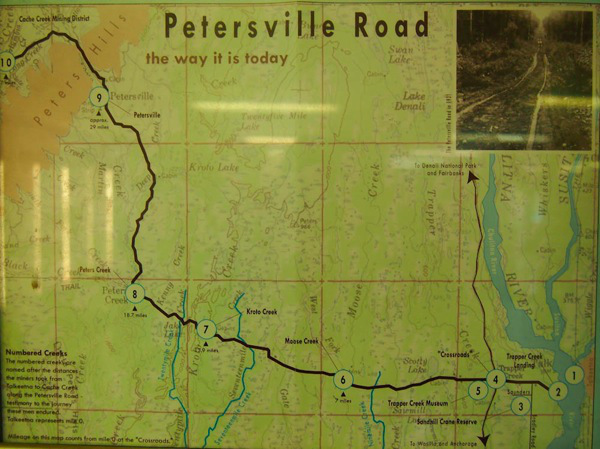 Petersville Road began in 1917 and our portion of the Parks Highway opened in the 1960's. The first semi-permanent inhabitants of the area, The Rabidoux brothers, arrived in 1909. 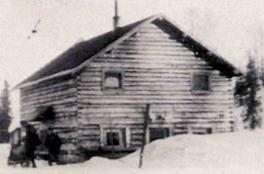 In 1939, Shorty Bradley staked a homestead along Petersville Road and he is considered the beginning of modern day Trapper Creek. Today, a little over 400 people live in the area. Homes and cabins spread over roughly 365 square miles are nestled in the foothills of the Alaska Range.